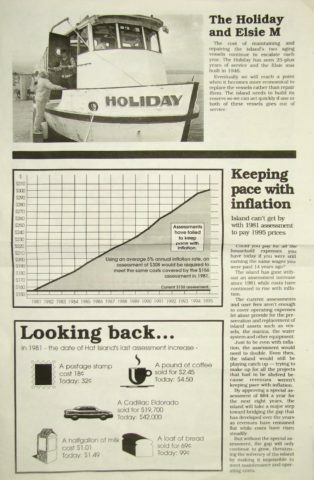 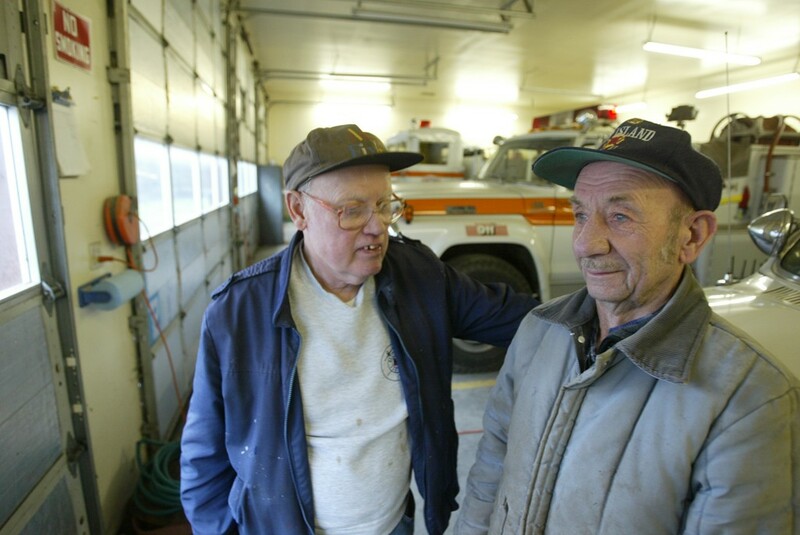 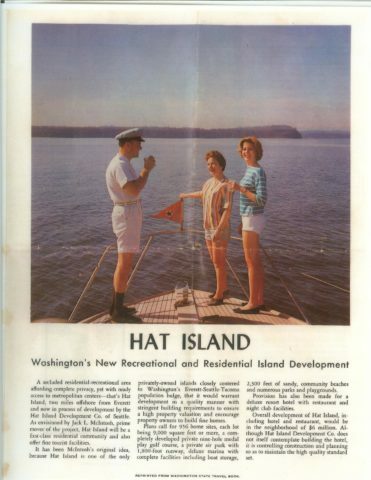 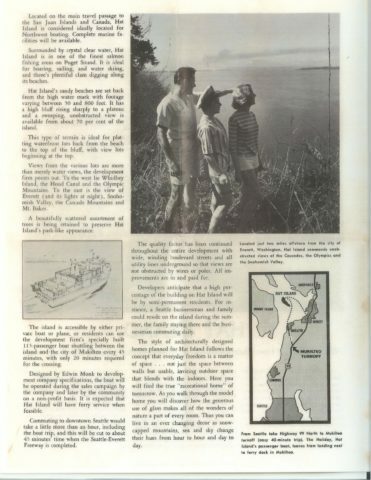 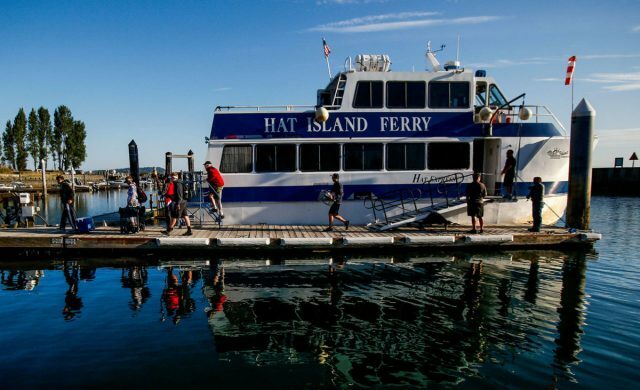 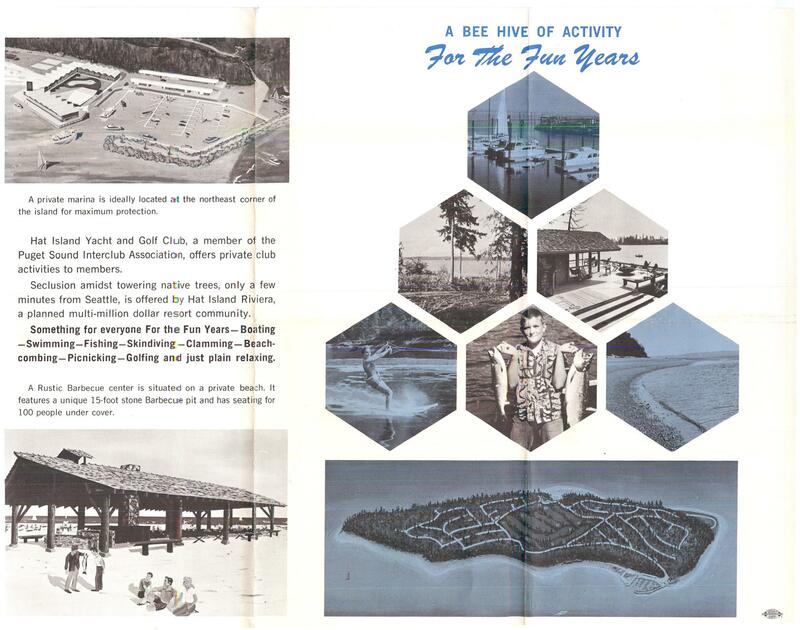 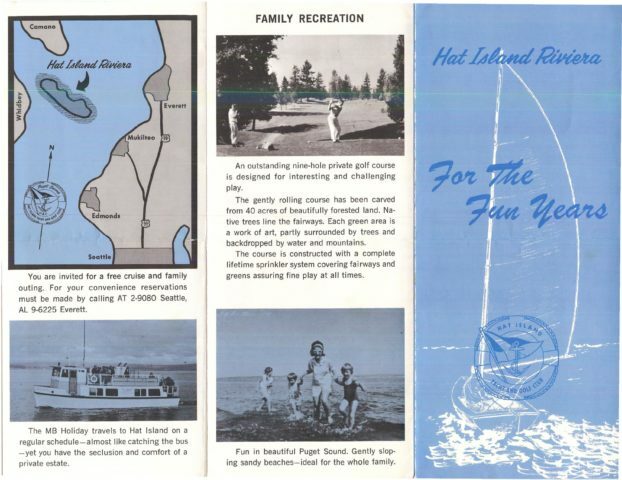 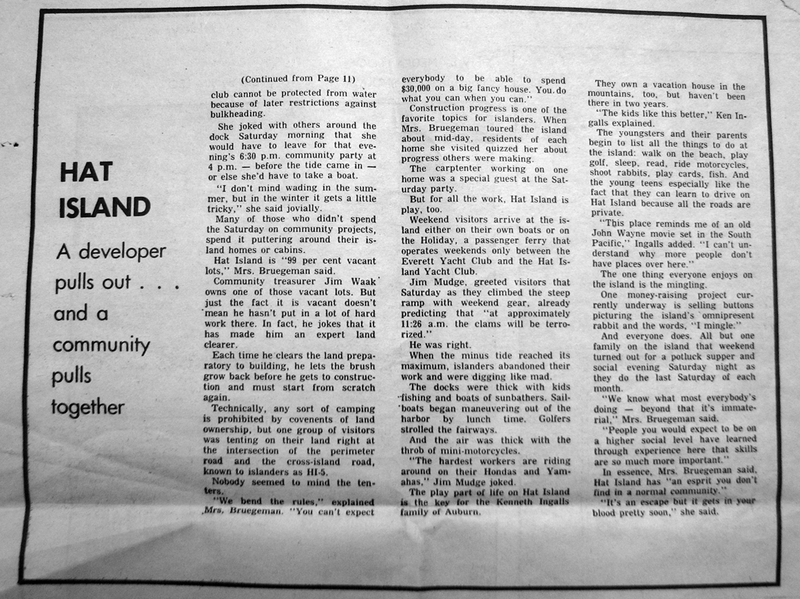 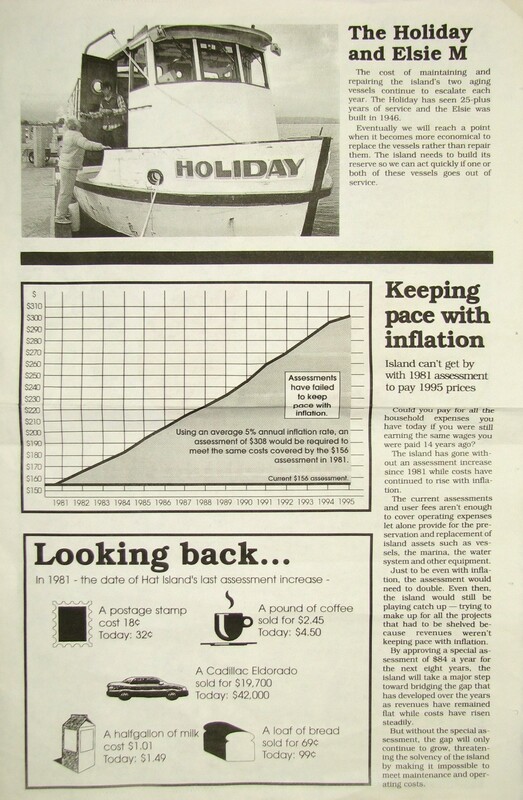 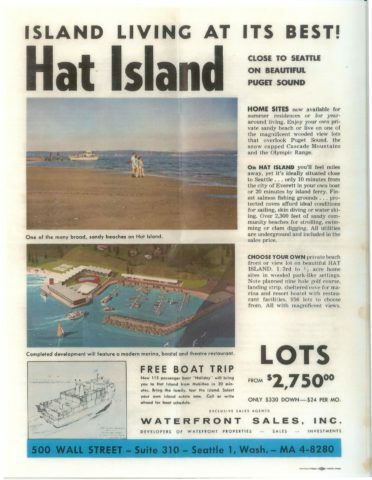 Take a scroll though Hat Island’s history with our collection of news clippings, articles, advertisements, pictures, videos, and even a recent TV appearance. 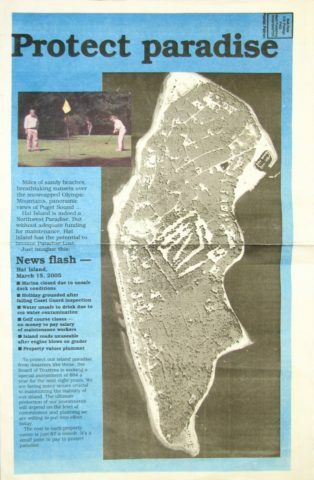 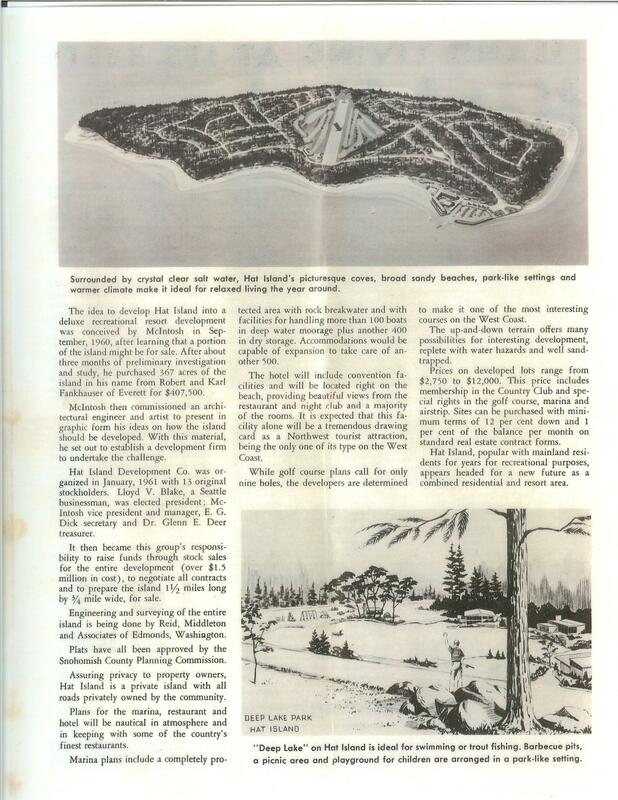 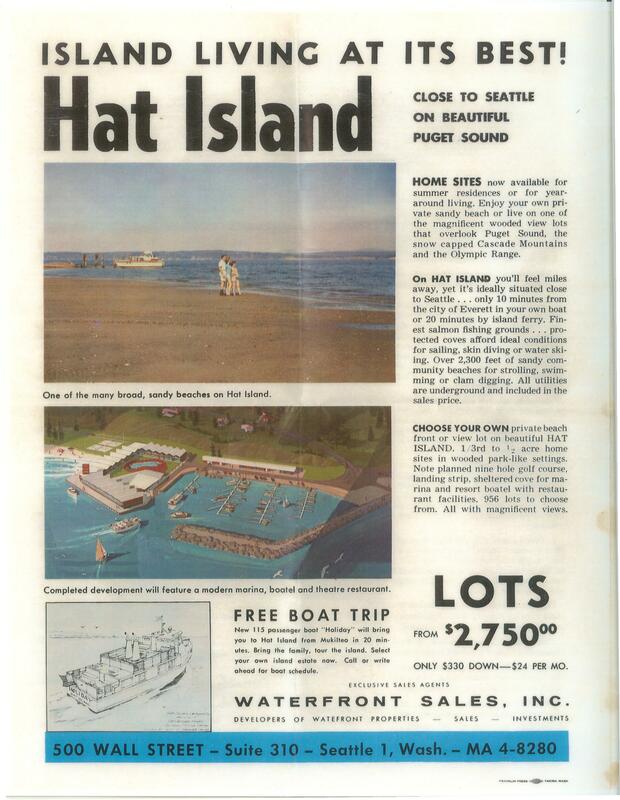 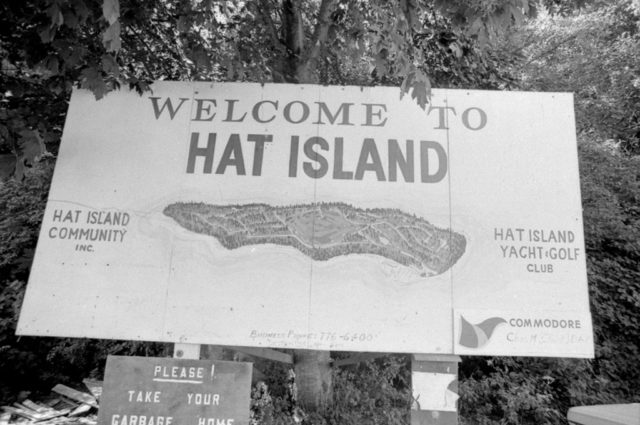 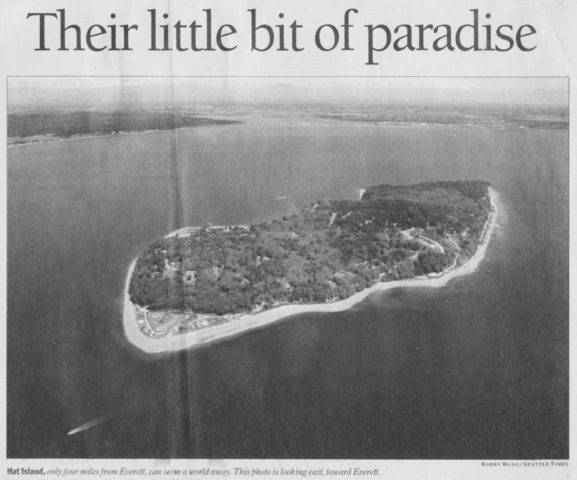 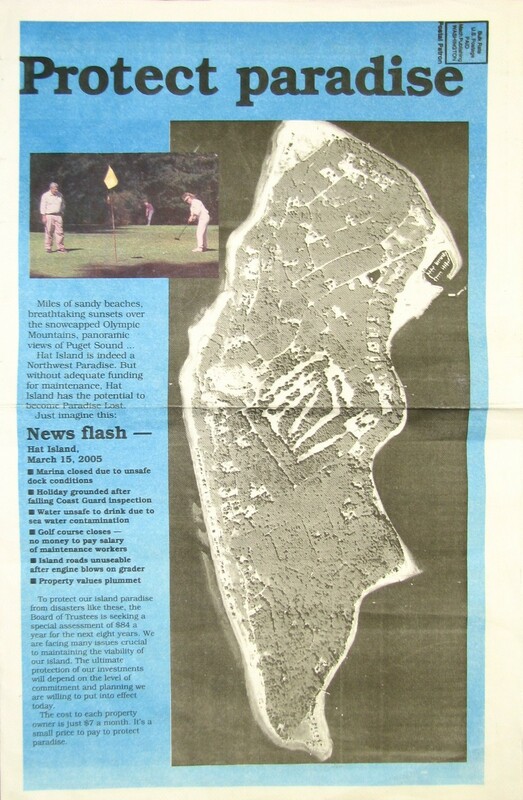 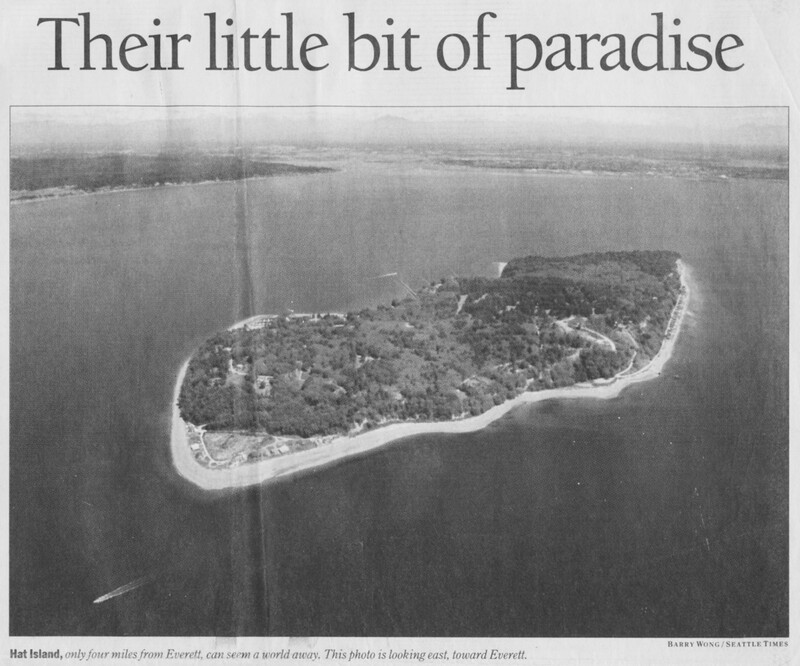 This overview of Hat Island appeared in the Seattle Times on Friday, June 30, 1995. 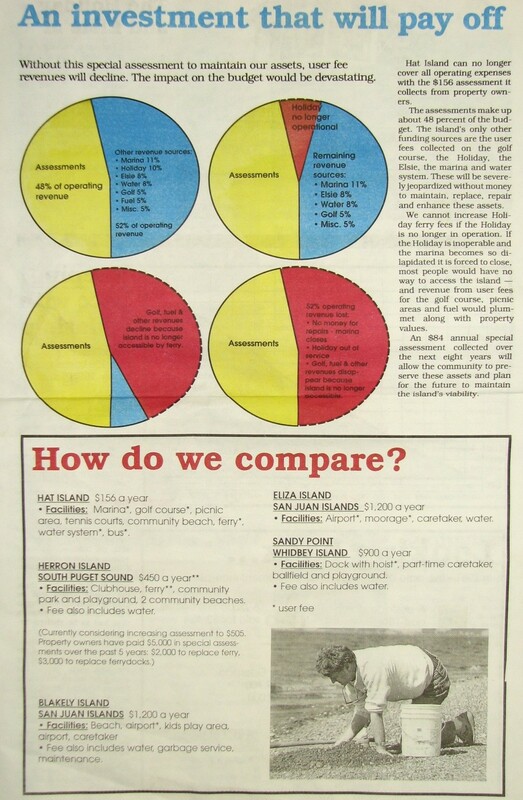 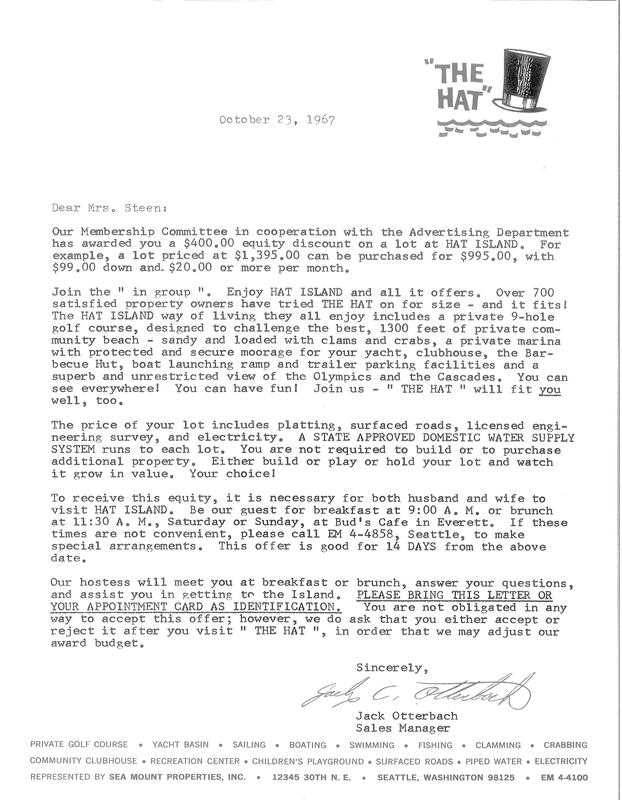 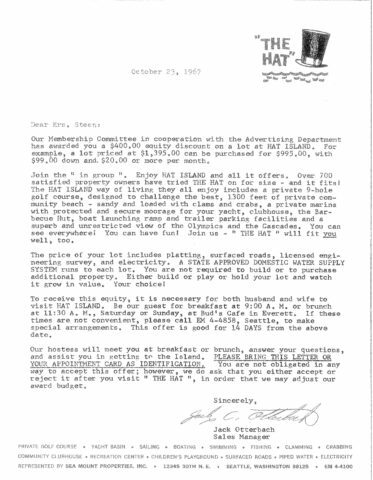 This is the flyer created by Don Condit describing the community’s first special assessment. 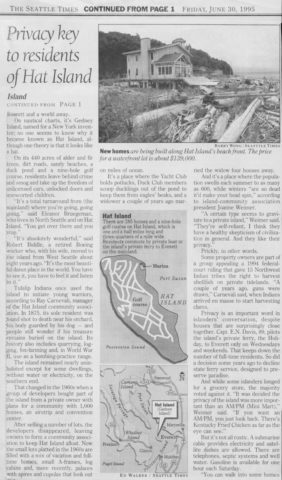 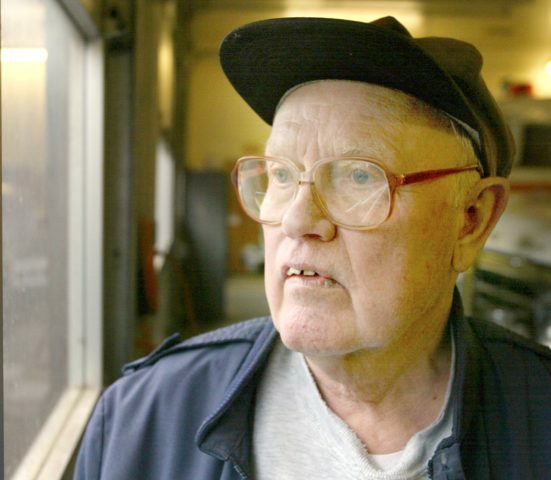 The special assessment was for $84.00 per year for 8 years and was used to cover major community expenses over $10,000 without the need for separate votes. 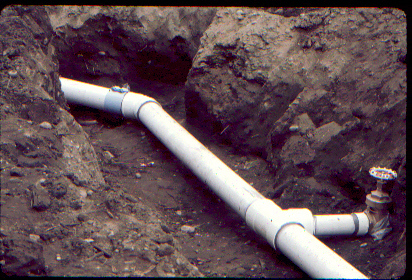 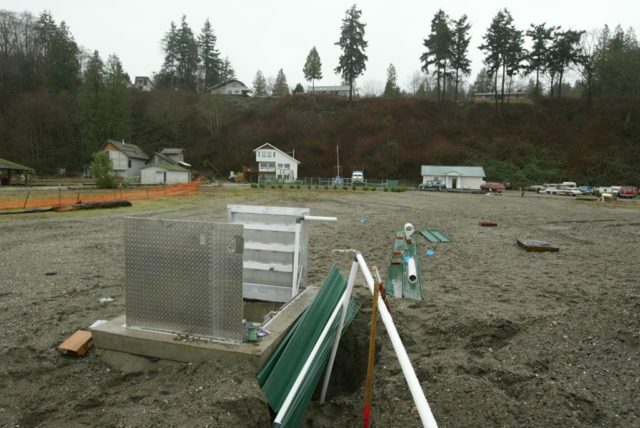 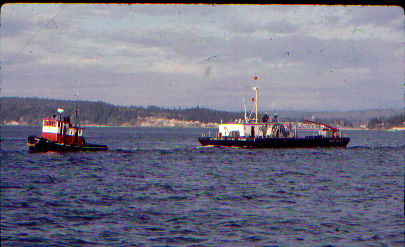 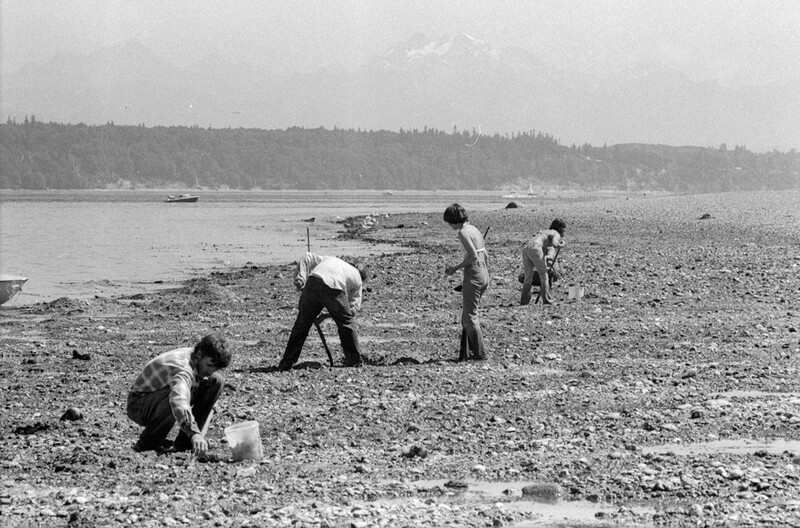 In 1974, as a direct result of the 1971-1972 Community Development Study, an underwater electric cable was laid to Hat Island from Mission Beach. 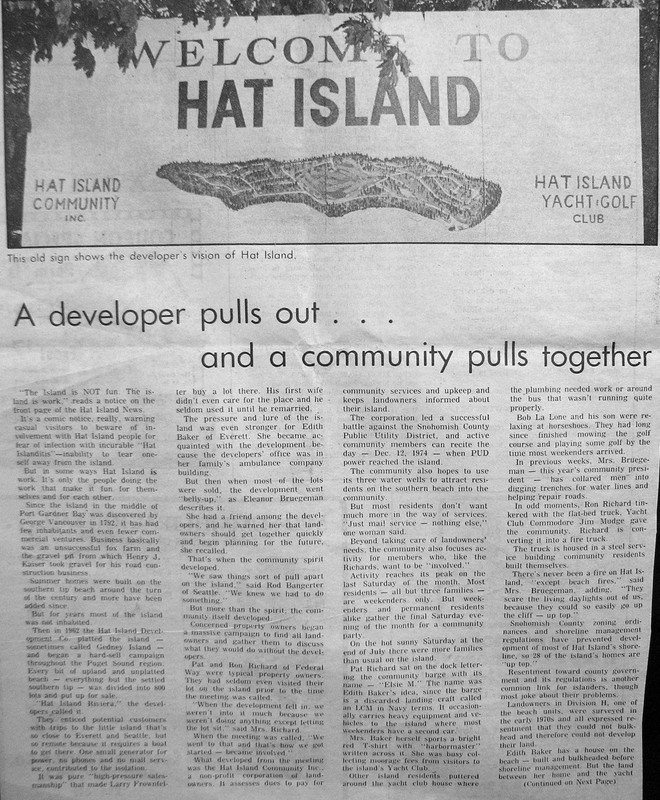 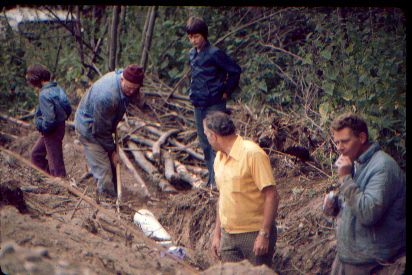 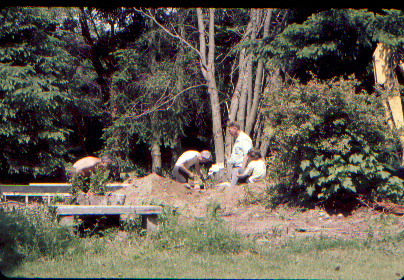 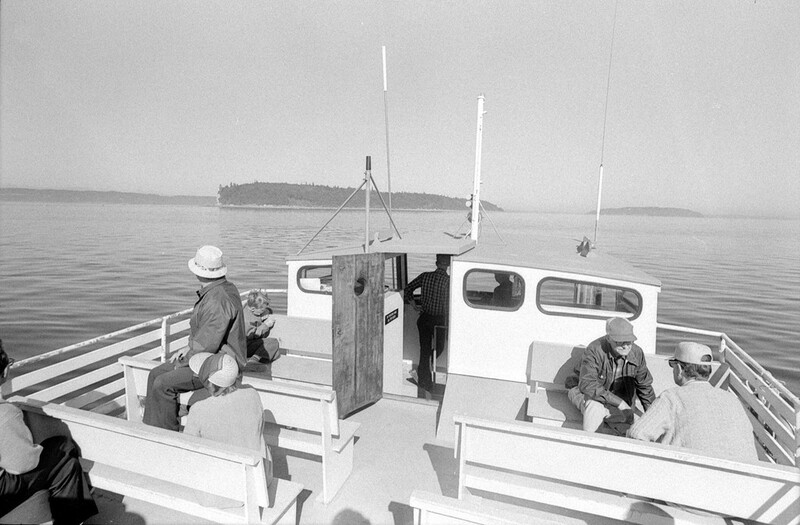 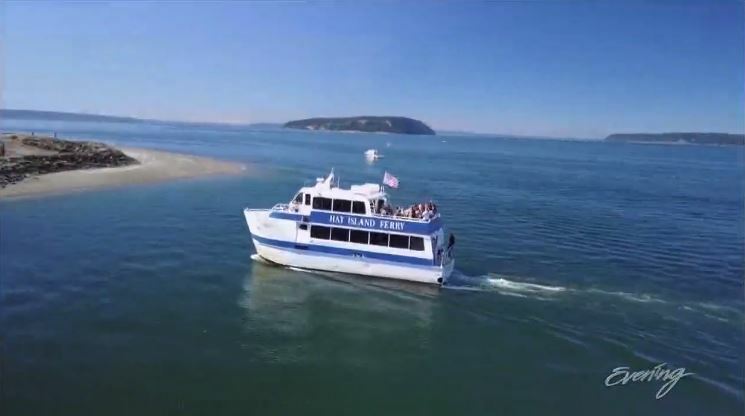 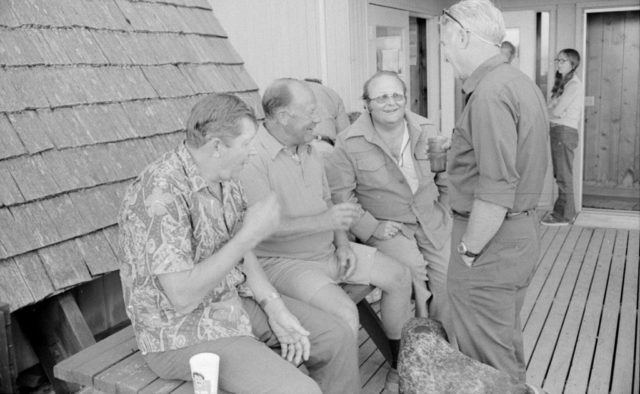 The Holiday was the vehicle for PUD executives and engineers and Hat Island board to watch the project being done. 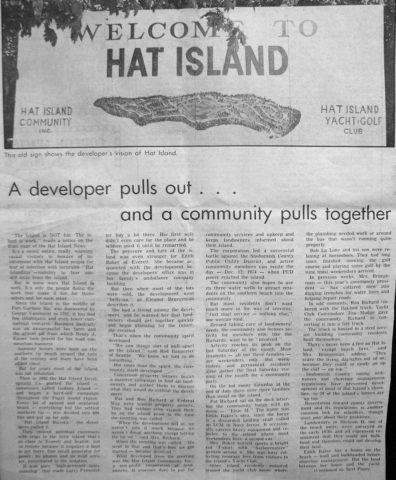 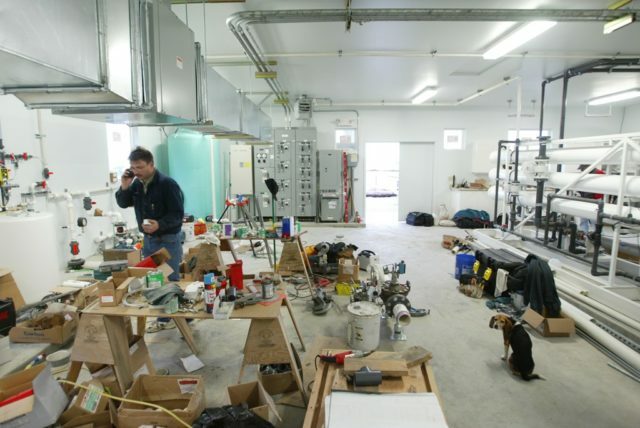 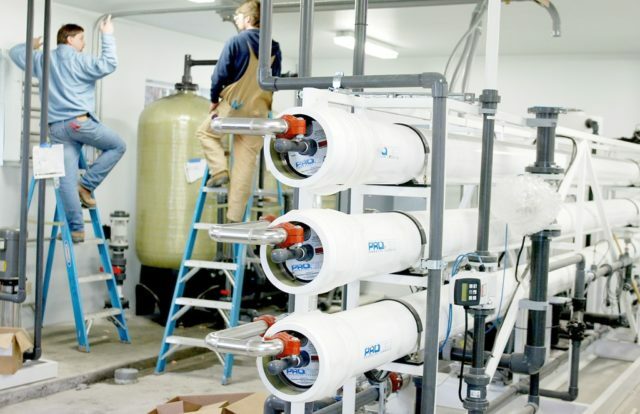 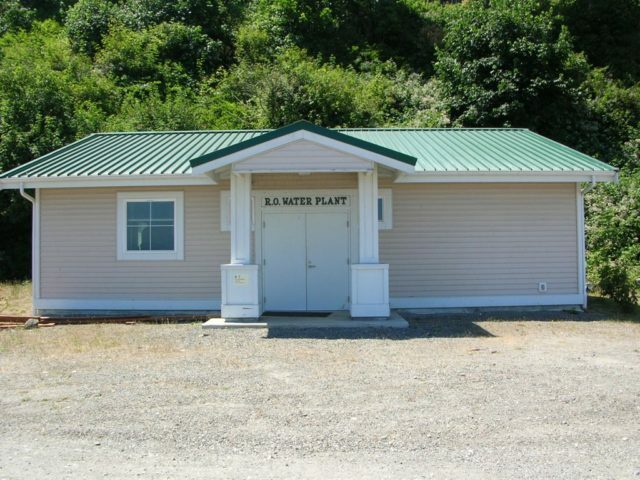 This project was a very exciting for both the PUD and Hat Islanders. 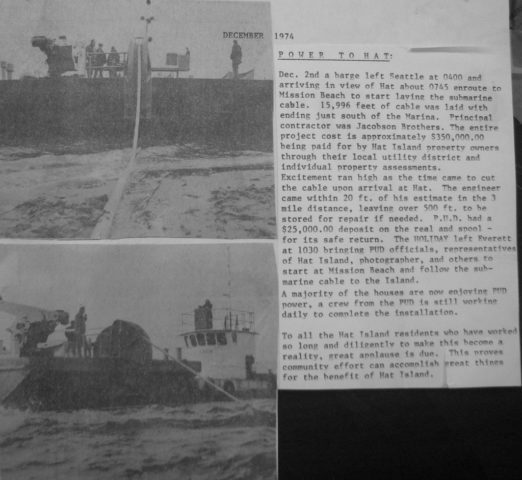 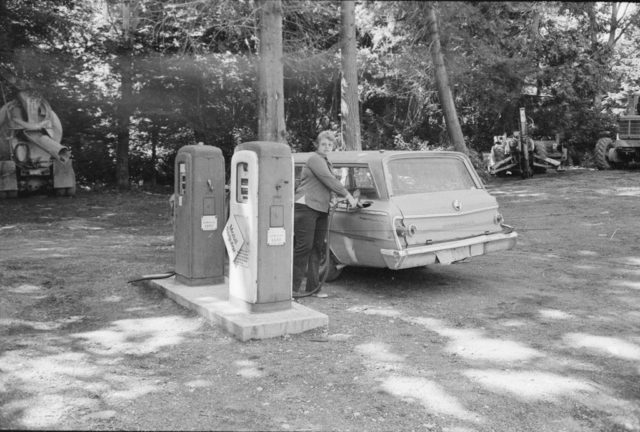 This was the first underwater cable for the PUD and Hat Island had been running on generators that were less than reliable. 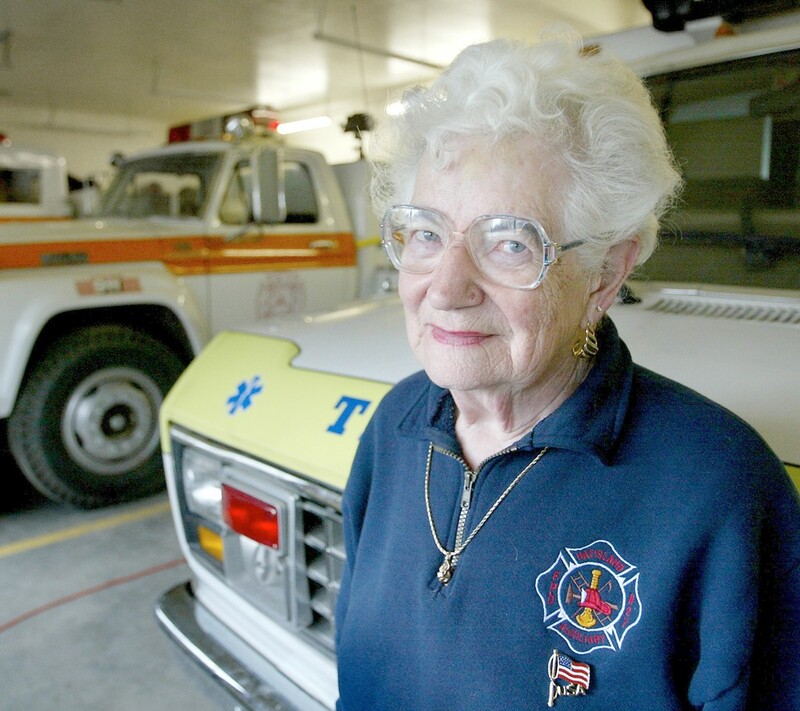 Our Elsie M was also involved in the project. It was raining and a dark and dreary day much lightened by the exciting project and unrealistic successes. 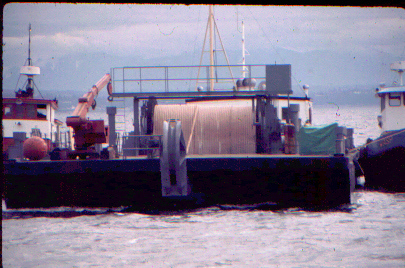 Basically there were no problems from one side to the other. 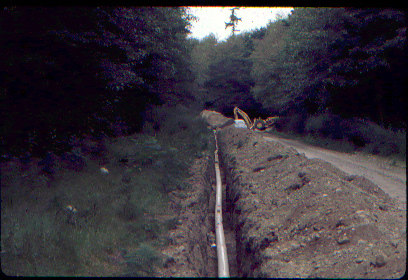 The cable was energized on December 12, 1974. 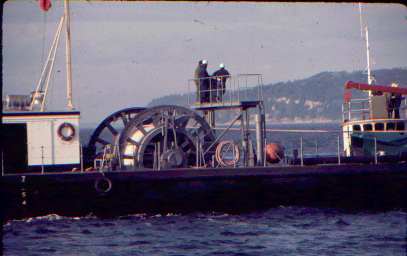 Mission Beach where the cable originates. 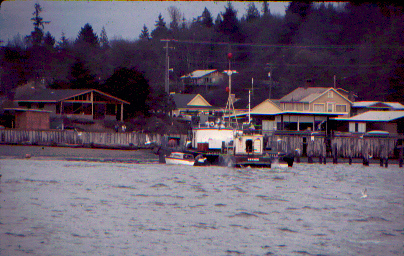 Note large power pole in the background. 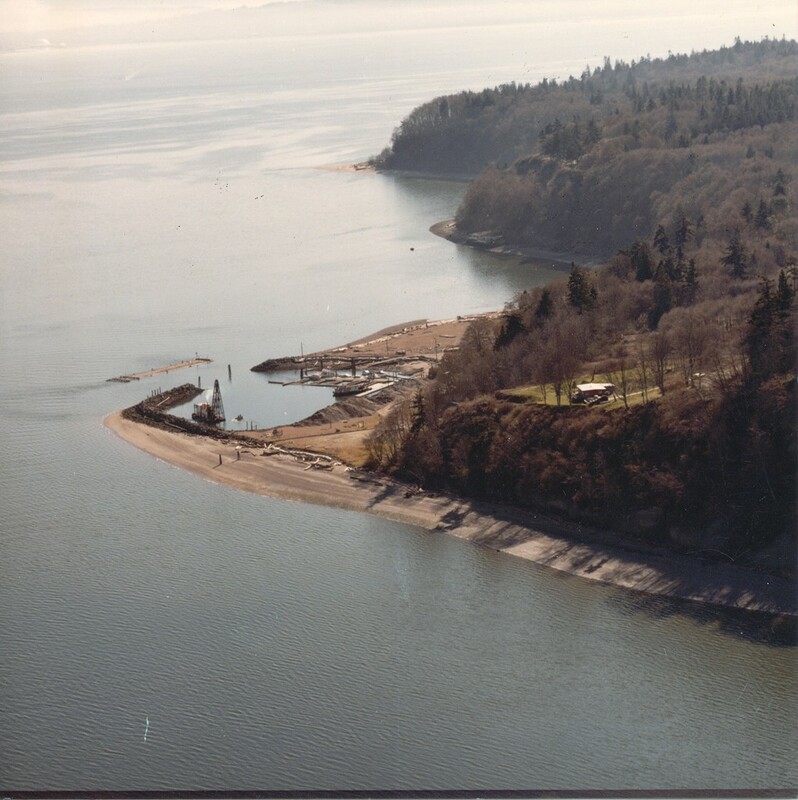 The overhead lines on the mainland are where most of the power outages occur. 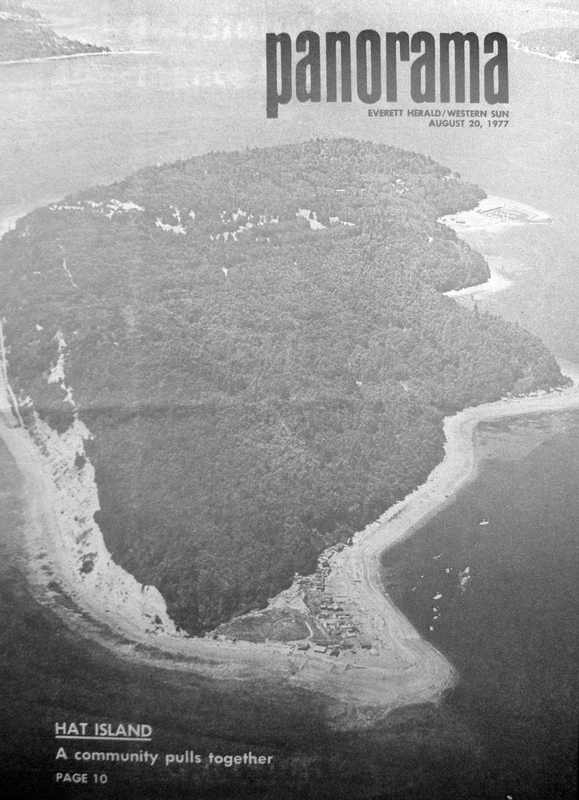 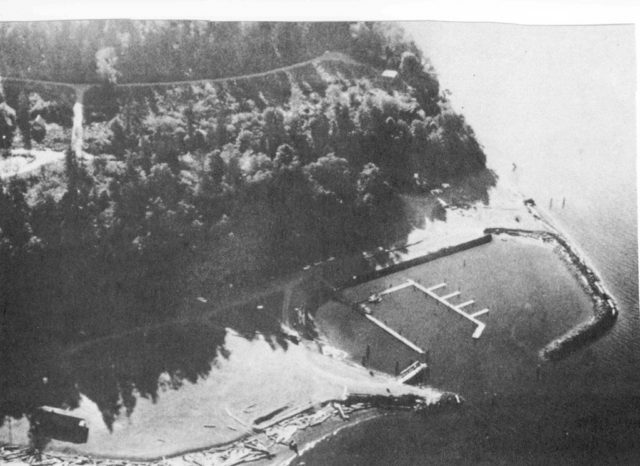 The black and white picture of the marina labeled 1972 was scanned from the aerial photo in the 1972 Community Development Study. 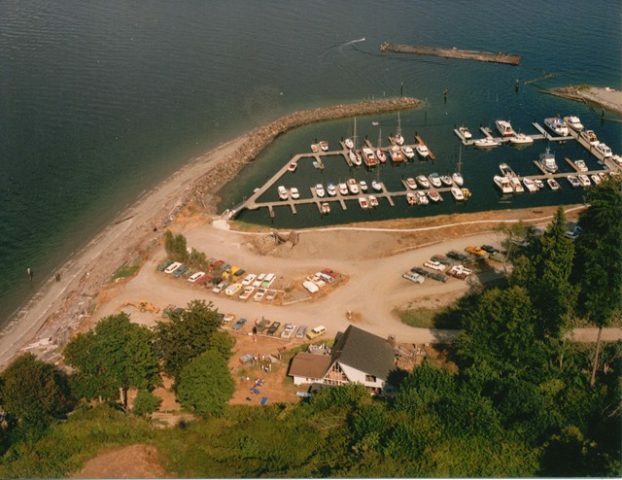 It shows the original configuration of the marina. 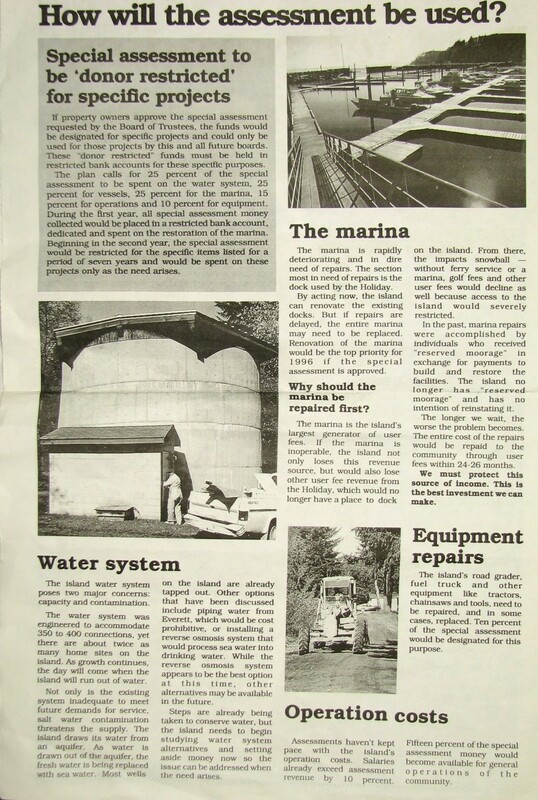 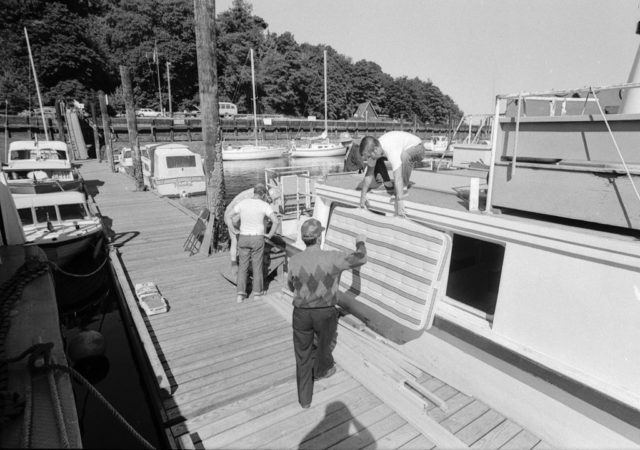 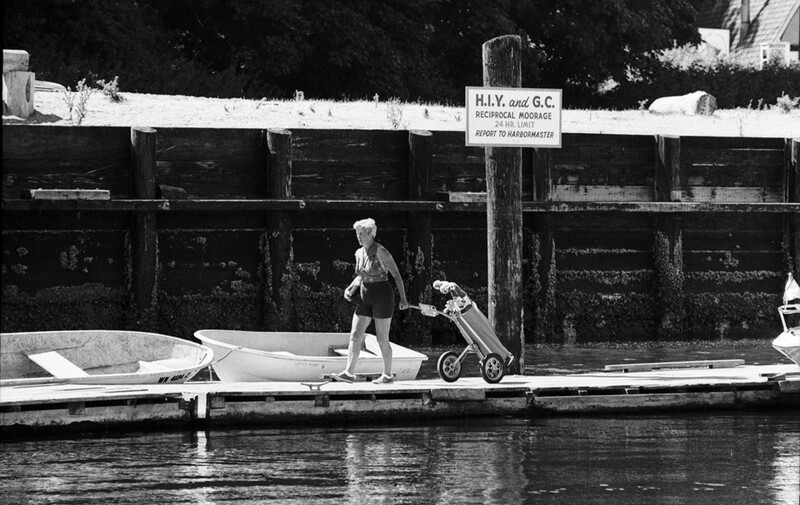 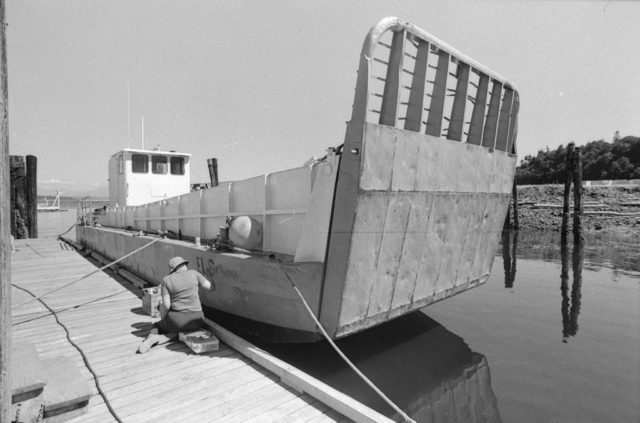 In 1978 the marina was dredged and the dock system expanded to the configuration shown in the second photo. 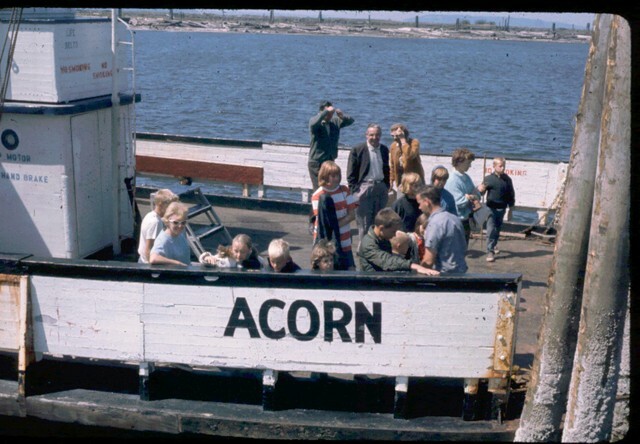 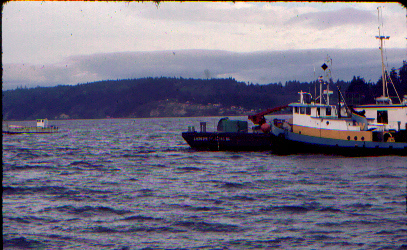 Notice the ferry bridge and ramp at the southern end where the ferry ACORN docked. 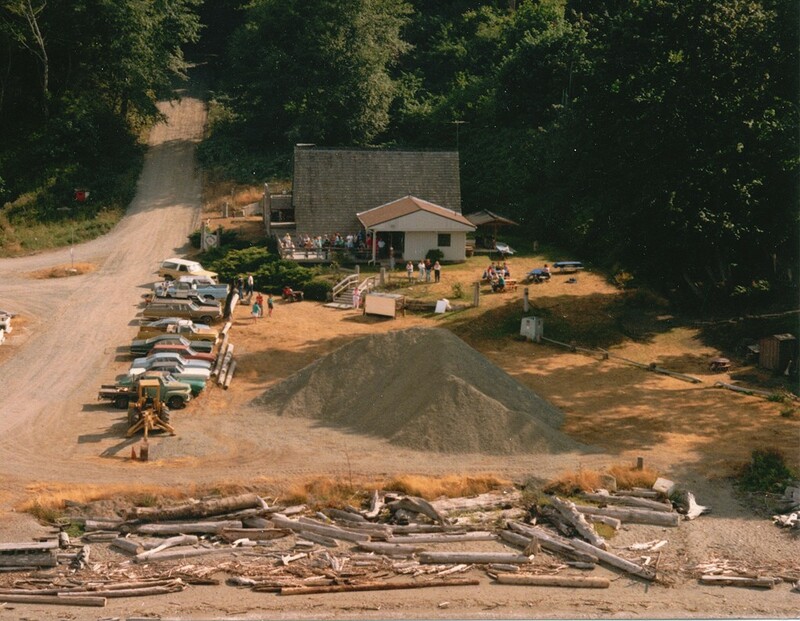 Out side the marina on the north side was the barge piling for barges to tie up to unload building materials. 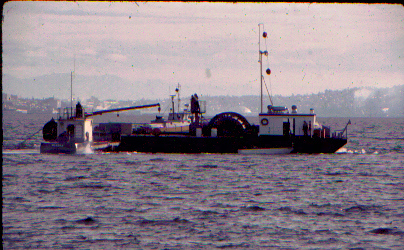 Pile driver in the northern corner of the marina driving pilings for the ramp bridge. © Copyright - Hat Island Community Association, Inc.